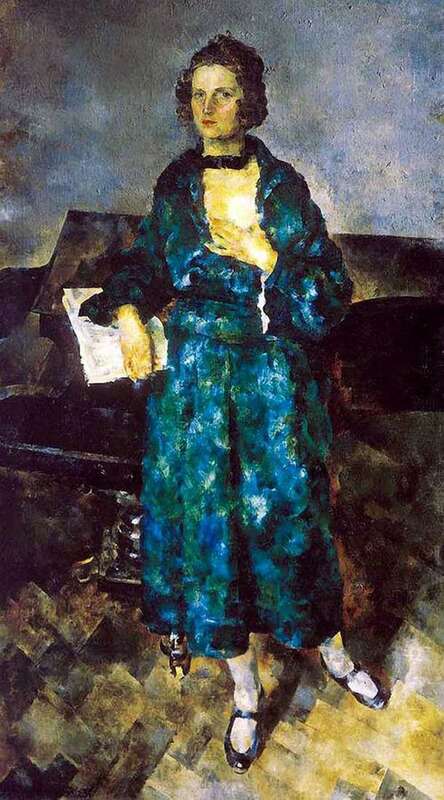 “Portrait of the artist’s wife” – one of the many works of Vasily Vasilyevich Rozhdestvensky. It is worth noting that, choosing the name for the work, the artist went on a very simple way. In the world of art a lot of work with this name. Thus, artists from all over the world, including Vasily Rozhdestvensky, create an artificial areola of mystery around work. This picture shows the wife of the artist, but, based on the name, we cannot say for sure whose. Also, the artist seems to be moving away from the canvas, looking at the image from a completely different angle. As a result: the image of a mysterious stranger. The artist as if with a fresh look again looks at the woman. For the first time sees her features, her figure. The woman depicted in the center of work is, as it were, a collective image. The artist invites us to become acquainted with the ideal, canonical woman. Only such a lady should be the second half of a true artist. We see that the woman is depicted in full growth. There is a certain theatricality in her pose. Right foot mannered set aside. The left hand is in the chest, it seems that a woman is even trying to bare, pull back the collar of the dress to show your body. She is not afraid to pose. But there is some mistrust or discontent in her view. The eyes of a woman are dark and stern. On the woman – dress to the floor. It is quite difficult to determine the exact color of the dress – something between a turquoise and blue. Because of the sweeping technique of writing, dyes mix, create bulkiness and relief of the fabric. A special detail of the dress is a black decoration on the neck. This wide velvet ribbon, tied in a small bow is a very risky and challenging accessory. Woman posing, leaning on the piano. Notebooks are scattered on top of the musical instrument. The artist’s wife is obliged to belong to the creative community, she must also be a man of art.